When I think of my "perfect" SF RPG setting, GDW's Third Imperium setting for Traveller almost always comes immediately to mind. There's a good reason for that. Despite the immense amount of detail that it eventually spawned, its core conception -- an interstellar empire so large that authority remains distant, thereby creating the necessity for individual action -- is eminently gameable. Indeed, it's probably the best way to create an interstellar sandbox setting ripe with opportunities for the player characters to seek their fortunes in whatever fashion they see fit. And it all began modestly in a little 42-page supplement called The Spinward Marches and first published in 1979. (This isn't technically true, as details of the Third Imperium setting had appeared before the release of this supplement, but this was many Traveller players' first introduction to it -- no surprise given that it had over 40,000 copies over 14 print runs) This product describes the 16 subsectors of the Spinward Marches sector, consisting of over 400 worlds, more than half of which are Imperial worlds, the rest being divided amongst the Imperium's main rival, the Zhodani Consulate, various smaller states, and independent worlds. Each subsector gets a two-page write-up, with one page providing a brief overview of the subsector and a list of its worlds and their game statistics, and another page presenting a map of the subsector and the express boat routes between them. It's an incredibly bare bones approach, leaving lots of room for individual referees to flesh out the Spinward Marches as they see fit, within the bounds of the basic data provided. Of course, Traveller's world descriptions are famously vague, with lots of leeway for individual interpretation of, for example, government types and other similar information. What The Spinward Marches is then is a largely blank canvas on which a referee can paint his own picture. Some elements of that picture have already been drawn in outline, but the specific shades and hues, as well as the fine details, are left entirely up to the referee to decide. As a gaming product, The Spinward Marches has few peers in the realm of setting design. It's an incredibly open-ended, flexible supplement that can be used in a wide variety of ways. Moreover, it contains so many worlds that one could, quite literally, use it for many years without ever exhausting all of its possibilities. That was certainly true of my old Traveller campaigns, which generally took place over only three or four subsectors -- barely a quarter of its contents. If The Spinward Marches has a flaw, I'm not sure what it is, beyond that fact that several world names get repeated among its 439 planets. Certainly there's not a lot of detail here, but that's by design. Part of the fun for the Traveller referee has always been finding new and devious ways to interpret the alphanumeric world descriptions in ways to make the characters' lives "interesting" (in the Chinese curse sense) and this supplement removes a great amount of the tedium of having to randomly generate those descriptions oneself, since, in 1979, almost no one had a home computer to generate them automatically. 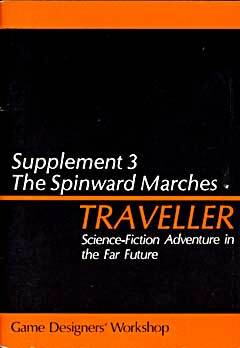 Though I'm no longer as obsessive about Traveller as I once was, I still retain much fondness for the game and products like The Spinward Marches are a big part of why. Its supplements were, by and large, truly optional and intended as aids to creativity rather than replacements for them. Likewise, the default setting of the game was remarkably broad and demanded that it be individualized by each referee in order to be fully usable. I can't help but love that, which probably explains why I'm reflexively skeptical of settings that provide lots of detail. The Spinward Marches proved you didn't need a lot of details to make good use of it -- in fact, it was better that way. "The Spinward Marches proved you didn't need a lot of details to make good use of it -- in fact, it was better that way." A great summation of a truly great supplement. How things have changed! Or maybe they've come full circle? Allow me to put forward my view. In the days of Classic Traveller (CT), the style was definitely sandbox. Most of the early adventures hinted at the presence of the Imperium. It was a vague presence that seemed to exist "above" the players' activities. It wasn't until the publication of the two Library supplements that players got to see how the setting looked and operated. As CT morphed into MegaTraveller (MT), the setting became more fixed and became an integral part of the game. The supplements looked into the minutiae of the setting and developed it further. This continued through The New Era (TNE) and into the GURPS version (GT). There, the Imperium was developed even further. The equivalent supplements in GT for the Spinward Marches and the Solomani Rim (the two big settings for CT) detailed every planet, devoting about a page of description to every system. In some cases, entire books the size of a single CT supplement were concerned with a single system. Meanwhile, the Traveller players seemed to become adverse to alternative settings. Traveller had become the Imperium, and the Imperium had become Traveller. Huge amounts of effort were (and still are) devoted to categorising every possible aspect of the Imperium, with flame wars erupting over points of canon. Of course, it has to be remembered that this was the time when every game had a metaplot built into it, not just Traveller. Other culprits included White Wolf's WoD games, DP9's line and even RTG's Cyberpunk (!). Traveller 4 (T4) turned up and seemed to herald a change in attitude. Although the setting was still in the Third Imperium, it was at the start of that era. Players had the opportunity to explore and develop history for themselves. Various other milieus were hinted at for the game (the Zhodani core expeditions and the end of the universe spring to mind). Unfortunately T4 sunk under the weight of its own errata and vanished. Now Traveller is in its latest incarnation from Mongoose (MgT), with Traveller 5 (T5) still only in beta testing and available to a select few. Both have been promised as toolbox rules, but so far only MgT has delivered. Like CT, MgT has divided its books into rules, supplements and adventures. Anything for the Third Imperium is clearly marked as such and is not considered part of the core rules. The MgT rules also support a greater variety of settings: licensed game include Judge Dredd and Strontium Dog, and fans are being encouraged to publish their own settings using the OGL. Traveller fandom also appears to have split. There are still the canon-obsessives who haunt websites like CotI, but the Mongoose boards are (so far) less obsessive and more inclined to discuss generalities. The attitude of the MgT players seems to be that everything beyond the core rulebook is optional. It looks like MgT has managed to tap into the sandbox play of early CT, but still allows the Third Imperium fans to get their fix of the safety net of that setting. I must admit I have been buying into MgT precisely because it allows the freedom that the original rules did, albeit with 30+ years of development behind it. Even so, MgT does look and feel surprisingly like CT. Without ever playing Traveller, it also sounds like a cunning foundation for an ongoing product line. You can both in theory (1) publish individual-world supplements, and (2) still have room left over for Referee creativity, almost without end. Space settings have in advantage there: practically always room for expansion, as opposed to a fantasy line, where each location maps out more of a finite globe. But expansion like that does cause the "split" problem later on about how committed you are to re-publishing or collecting the supplements as canon, etc. I agree that Mongoose's version of Traveller has seen a return to the open-ended spirit of the early Classic Traveller period. Interestingly, their version of the Spinward Marches supplement provides a detailed description of only 1-2 worlds per subsector and leaves the rest for the referee to develop. Furthermore, the introduction to the book emphasizes that there are so many inconsistencies and contradictions in established Traveller canon that individual referees should feel free to ignore the past and redesign the setting any way they like. "Canon is something that game designers worry about. It is a baseline used to ensure that published materials do not clash or contradict one another. Once an individual Traveller Referee starts running a game, the Official Traveller Universe becomes that Referee’s Traveller Universe....What this all means is that once you get your hands on this book, the Traveller Universe becomes YOURS. You decide what concepts to ignore, which ones to use and which ones to replace with something that fits the setting you want to play in more closely...If you have an old magazine that says that planet X has a moon made of cheese strings and it has been omitted here, you get to decide whether you want cheese–string–moon in or out of your Traveller Universe. This sourcebook is a starting point, not a straitjacket." The book essentially encourages each gaming group to develop their own version of the Spinward Marches within the broad framework provided. It's refreshing to see such a strong rejection of canonicity in favor of sandbox-style play in a major campaign sourcebook. "It's refreshing to see such a strong rejection of canonicity in favor of sandbox-style play in a major campaign sourcebook." "In that regard, I wonder how much of a necessary condition it is that Mongoose lacks rights to the Traveller publication back-catalog?" It might be a significant factor, but there is also evidence that Mongoose is actively trying to push the notion that the Traveller RPG is a generic SF ruleset that can be used with a variety of different settings. As mentioned previously, in addition to the Third Imperium sourcebooks, they have released licensed Traveller conversions for the Babylon 5 universe and a couple of the 2000AD comic properties (Judge Dredd and Strontium Dogs, with ABC Warriors on the way). Furthermore, they are producing the original Cthonian Stars campaign setting later this year that mixes the Traveller SF rules with Lovecraftian horror. And they have encouraged third-party publishers to produce alternate Traveller settings under the OGL. Hence we have the Reign of Discordia setting from Reality Deviant Publications, the Twilight Sector Setting from Terra/Sol Games, and the Hyperlite setting from Sceaptune Games. This is a HUGE change from the days when the Traveller rules where tightly coupled to the canonical Third Imperium setting and may encourage a return to the ethos of the homebrew Traveller sandbox. The original Spinward Marches was too terse in it's presentation. I think if it had the level of detail of the Regina Subsector in the Traveller Book it would have been a lot more useful. One or two sentences for most worlds with a paragraph or two for the most important or interesting. There is a line for adequate detail in a sandbox setting like the Spinward Marches. What makes it interesting is the history of various products that detailed the region. I always felt that each never got it quite right detail vs terseness. This includes the GURPS version and the Mongoose Traveller version. If the Traveller Book approach was expanded to encompass the entire sector that would be been perfect. However that quibble aside the Spinward Marches stands alongside the Wilderlands as the original sandbox setting. This is all good to hear. I've not really gotten into MgT, because I have most of the original run of the game and don't see the need to replace it, but it's gratifying to hear that the new version of the game is having a positive effect. And this remained true throughout the entirety of the game's history, up until "macro-level" events came to dominate the product line. I understand why GDW went this route but it was a mistake. The original Spinward Marches was too terse in it's presentation. I'm of two minds about that. On the one hand, yes, it is too terse and it demands a lot from the referee in order to make it usable. On the other hand, that's kind of the point. Traveller's earliest supplements were largely time savers, providing lots of randomly generated stuff to be used as the raw materials from which to craft adventures. There's a part of me that worries that, the more you step away from the terseness of The Spinward Marches, the more you run the risk of building intrusive canon and down that path lies the Dark Side, so to speak. "The book essentially encourages each gaming group to develop their own version of the Spinward Marches within the broad framework provided. It's refreshing to see such a strong rejection of canonicity in favor of sandbox-style play in a major campaign sourcebook." I've never understood why referees wouldn't take this approach. It's how I've always played - I use the stuff I like to turn the game into my own, and I ignore the rest. Worrying about using all of the small levels of minutiae that are printed in some "campaign guides" seems pointless. Sure, sometimes it can be fun to read, but games are meant to be played, and most of that information has very little impact on the game. People who get onto message boards to argue "points of canon" for campaign settings baffle me. The setting is what I, as the referee, says it is for my particular group of players. Indeed. I recently fell afoul of this on an official board for a certain game. I was asking a question about a point of detail in one of the supplements, and finding that it was a throwaway reference without any meaning, I then explained how I would use it. Almost immediately, someone popped up to "correct" me, at which point I explained that it was my version of the setting, and I could do what I liked with the materials. "I'm not sure what it is, beyond that fact that several world names get repeated among its 439 planets. " Then again, how many US states have a town called Springfield. If you look at the full galactic map (http://www.travellermap.com/), there are all sorts of interesting names that get used. I like that there is a system called Nyarlathotep in the Solomani Rim. There's also a Scaramouche. I do recommend checking out the Mongoose Traveller. It has a lot of the best aspects of CT in nice solid hardbound books. If I were to run a Traveller game again I'd use the Mongoose system and still refer to my large catalog of previous books (CT and GURPS mostly) for inspiration. Planetary info is still compatible, which is all you really need for a million adventure ideas. Just looking at the picture of Spinward Marches gets me excited to play Traveller! I am a Classic Traveller guy, but I have the Traveller Book and what-not, so I never needed that actual Spinward Marches little book. I can see how the Traveller rules got meshed with the Third Imperium as a setting, but that never bothered me... I think the Imperium is cool! I like Greyhawk too. I just recently found a copy of 76 Patrons (one of the few remaining supplements I don't have). Talk about usefulness... I just browse that before bed for all kinds of ideas! Traveller's earliest supplements were largely time savers, providing lots of randomly generated stuff to be used as the raw materials from which to craft adventures. Indeed and in dawn of the personal computer era they were a great thing to have. But today that is decidedly not the case with computers everywhere including in our phones. To save the referee time a supplement like 1001 characters, and the Spinward Marches need a touch more. The write up of the Regina Subsector in the Traveller Book is perfect. 76 Patrons likewise is perfect in this regard. While the sparse presentation encouraged many GMs to get creative, in encouraged a bland vanilla feel to the follow-on products. Regina was like Rhylanor was like Metractor. The worlds fell into a vaguely militaristic pastiche of late seventies culture crossed with occasional SF tropes. One of the big causes of this was Marc Miller. Marc is a pretty conservative guy, and flatly forbid topics like religion to come into the canon except in the vaguest ways. He really prevented the setting from growing. Without official sources of conflict inside the Imperium, it became vanilla. Which was fine, until other settings began offering 52 flavors. As for the names; the number of things in the United States named after John C. Fremont (http://tinyurl.com/yq6kst) give a clue as to why several worlds in the Marches share names. A leading Scout of the early explorations was commemorated by place names. Traveller was my first rpg. I loved it when there were only tantalizing bits of the 3rd Imperium, and I loved the details as they came out . I've never felt constrained by published materials, but as I've said before, I feel there is a certain obligation on a GM's part to be open with his players at the start. Specifically, "I'll be running a campaign in the Spinward Marches, but it's going to really be modified to my own tastes." I say this because many players I've known may enjoy playing in something more canon. Then potential players can make an informed decision. And for the record, when GDW went to Megatraveller, they lost me for two reasons: I didn't like their metaplot, and I didn't like the changes to the rules system. Certainly that's my decision to make, and no problem with people on either side of those preferences. I continued to run my campaign as I preferred it to be.